We thought the official state dirt of New Jersey was asphalt. Turns out they actually prefer something called Downer soil. “The [state] Assembly on Monday is slated to vote on legislation that would make Downer soil the official state soil, hoping to bestow upon the grayish brown and sandy dirt the same status given other state symbols, such as the eastern goldfinch, red oak and honey bee,” according to the Associated Press. Apparently farming is the third-largest industry in the state, behind pharmaceuticals and tourism. (It’s true. Come see for yourself.) 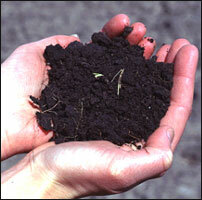 If the bill passes, New Jersey would become the 21st state to designate an official soil.